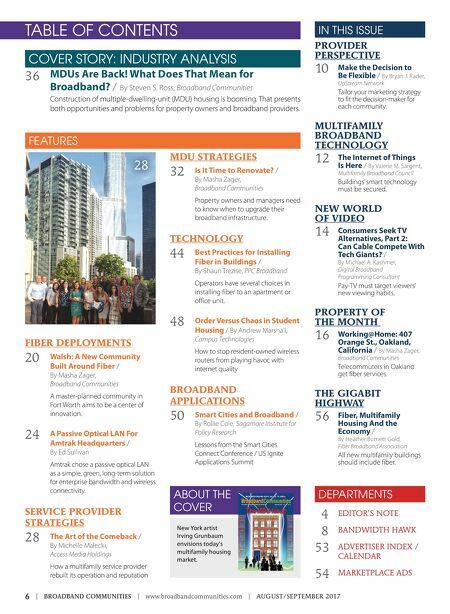 6 | BROADBAND COMMUNITIES | www.broadbandcommunities.com | AUGUST/SEPTEMBER 2017 TABLE OF CONTENTS FIBER DEPLOYMENTS 20 Walsh: A New Community Built Around Fiber / By Masha Zager, Broadband Communities A master-planned community in Fort Worth aims to be a center of innovation. 24 A Passive Optical LAN For Amtrak Headquarters / By Ed Sullivan Amtrak chose a passive optical LAN as a simple, green, long-term solution for enterprise bandwidth and wireless connectivity. SERVICE PROVIDER STRATEGIES 28 The Art of the Comeback / By Michelle Malecki, Access Media Holdings How a multifamily service provider rebuilt its operation and reputation MDU STRATEGIES 32 Is It Time to Renovate? 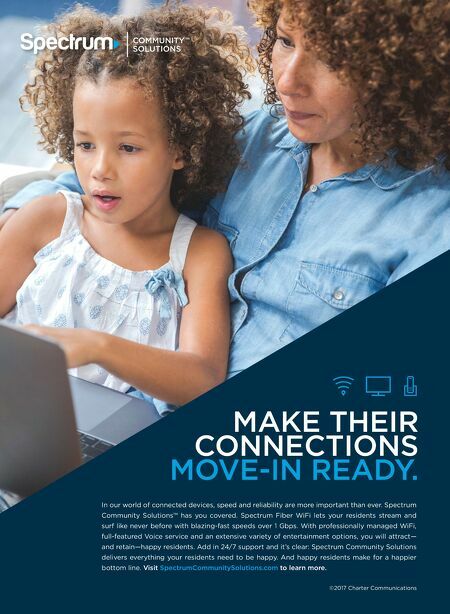 / By Masha Zager, Broadband Communities Property owners and managers need to know when to upgrade their broadband infrastructure. TECHNOLOGY 44 Best Practices for Installing Fiber in Buildings / By Shaun Trezise, PPC Broadband Operators have several choices in installing fiber to an apartment or office unit. 48 Order Versus Chaos in Student Housing / By Andrew Marshall, Campus Technologies How to stop resident-owned wireless routers from playing havoc with internet quality BROADBAND APPLICATIONS 50 Smart Cities and Broadband / By Rollie Cole, Sagamore Institute for Policy Research Lessons from the Smart Cities Connect Conference / US Ignite Applications Summit New York artist Irving Grunbaum envisions today's multifamily housing market. ABOUT THE COVER DEPARTMENTS 4 EDITOR'S NOTE 8 BANDWIDTH HAWK 53 ADVERTISER INDEX / CALENDAR 54 MARKETPLACE ADS IN THIS ISSUE FEATURES PROVIDER PERSPECTIVE 10 Make the Decision to Be Flexible / By Bryan J. Rader, UpStream Network Tailor your marketing strategy to fit the decision-maker for each community. MULTIFAMILY BROADBAND TECHNOLOGY 12 The Internet of Things Is Here / By Valerie M. Sargent, Multifamily Broadband Council Buildings' smart technology must be secured. NEW WORLD OF VIDEO 14 Consumers Seek TV Alternatives, Part 2: Can Cable Compete With Tech Giants? / By Michael A. Kashmer, Digital Broadband Programming Consultant Pay-TV must target viewers' new viewing habits. PROPERTY OF THE MONTH 16 Working@Home: 407 Orange St., Oakland, California / By Masha Zager, Broadband Communities Telecommuters in Oakland get fiber services. THE GIGABIT HIGHWAY 56 Fiber, Multifamily Housing And the Economy / By Heather Burnett Gold, Fiber Broadband Association All new multifamily buildings should include fiber. 28 COVER STORY: INDUSTRY ANALYSIS 36 MDUs Are Back! What Does That Mean for Broadband? / By Steven S. Ross, Broadband Communities Construction of multiple-dwelling-unit (MDU) housing is booming. That presents both opportunities and problems for property owners and broadband providers.